Danze Parma Towel Bars Modern 18" Brushed Nickel Cylindrical Towel Bar Rack: This Danze Parma 18" Bathroom Towel Bar Rack is built to last. The highest quality standards are used to precision manufacturer a top of the line fixture. Important features of this 100% BRAND NEW Fixture: Complete Item! Everything necessary for installation is included. Brushed Nickel 18" Single Towel Bar Rack - 18" Towel Bar Parma Collection - The Parma 18 in. Brass Towel Bar in Brushed Nickel makes a great decorative addition to your bathroom. With mounting hardware included, this towel bar can be installed quickly and easily. - Wall-mounted design - Brushed nickel finish - Brushed Nickel premier finish designed to resist fading and tarnishing. - Brass - Holds up to 10 lb. for towels - Coordinates well with other Danze Parma bath products (sold separately) - Includes mounting hardware for easy installation - Matching Accessories Available - Easy to Install - Installation instructions included. This fixture is manufactured by Danze and is part of their Parma Collection. The Parma 18 in. Brass Towel Bar in Brushed Nickel makes a great decorative addition to your bathroom. 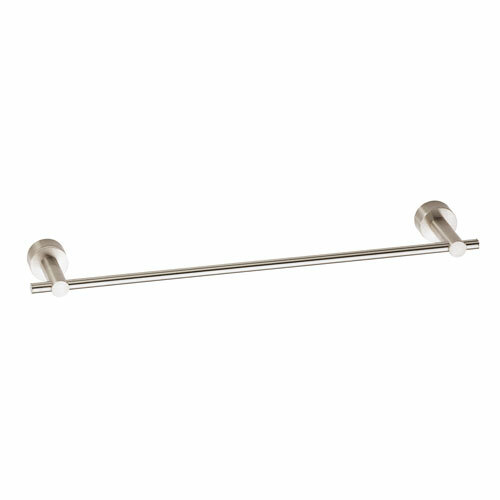 With mounting hardware included, this towel bar can be installed quickly and easily.